We love “cabin time”. It’s our euphemism for escaping the daily grind. There’s nothing like putting your phone on silent (or finding a spot with no cellular service) to spend some time with real people, engaging in real activities. 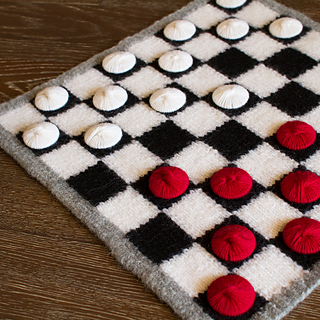 Whether it’s a picnic, a ball game or a weekend away in the wilderness, we always take our epic checkerboard along. 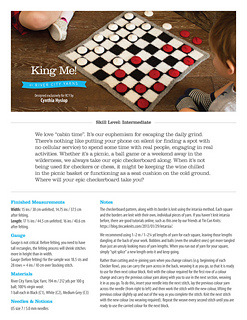 When it’s not being used for checkers or chess, it might be keeping the wine chilled in the picnic basket or functioning as a seat cushion on the cold ground. 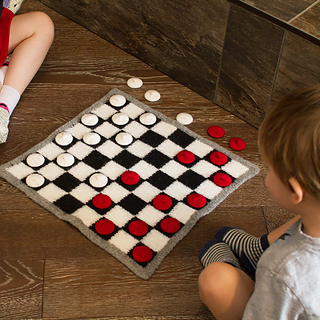 Where will your epic checkerboard take you? We used River City Yarns Epic Yarn; 194 m / 212 yds per 100 g ball; 100% virgin wool in three colours: Black, White and Medium Grey. Width: 15 ins / 38 cm unfelted; 14.75 ins / 37.5 cm after felting. Length: 17 ½ ins / 44.5 cm unfelted; 16 ins / 40.6 cm after felting.